For the second year running, the Kingfisher Calendar hosted model-hunt auditions across the cities of Delhi, Bangalore and Mumbai to offer beauties a chance to feature in India's ultimate pin-up exclusive. Here's how it all went down. It's that time of year again. Ace photographer Atul Kasbekar is in the process of conceptualising the eighth edition of the eagerly-awaited Kingfisher Calendar for 2011 and once again, he's offering a newbie to feature alongside seasoned models in sizzling bikinis at exotic beach locales. Toward this end Kasbekar has held three auditions in Delhi, Bangalore and Mumbai to find the next Kingfisher bikini bombshell and the response has been overwhelming. Why? Because celebrities like Katrina Kaif, Yana Gupta and supermodel Ujjwala Raut have all graced the calendar's pages in recent years. As Kasbekar himself put it in an interview with rediff last year, "Perceptions are changing. Today, all models and those who want to join the modelling industry are seasoned about baring their bodies." Once the 12 finalists have been short-listed, they will be flown to Goa for the final rounds of the selection process, which will be telecast on NDTV Good Times from October 11 onwards. Audiences will be able to view how leading fashion photographers and stylists from across the country groom and test the girls in a bid to choose the winner. In the meantime, we offer you a first look at the auditions in the following pages. Last year's winner, Himarsha Venkatsamy is also participating in the selection process for 2011 (check out her photographs from the Kingfisher Calendar 2010 here). In every city, the judge's seat was occupied by Kasbekar and a fashionista guest -- in Mumbai it was Mandira Bedi grilling the contestants and sizing them up. In addition to answering the judges' questions, contestants had to get their height, weight and other vital statistics checked out. They went the whole hog, even strutting their stuff in bikinis on a ramp. With the overwhelming response, it's not surprising that the girls had to queue up and await their turns patiently, but all of them had smiles on their lips and stars in their eyes. Too bad only one hottie will make the cut! Once inside, though, they were quick to show what they were about, gamely posing together and working their attitude for the flashbulbs. For the Delhi auditions, yesteryears supermodel Feroze Gujral, who still looks smashing, joined Kasbekar to help with the selection process. Himarsha did her best to help the calendar hopefuls get it right -- like she did last year. Looks like they were listening closely enough! 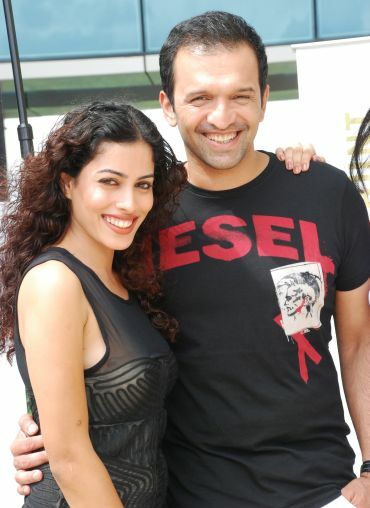 In Bangalore, model Sheetal Menon, who has also featured previously in the calendar, helped Kasbekar whet it down to the finalists. All the girls were perfectly at ease in swimwear, which goes to show the difference from a few years ago. 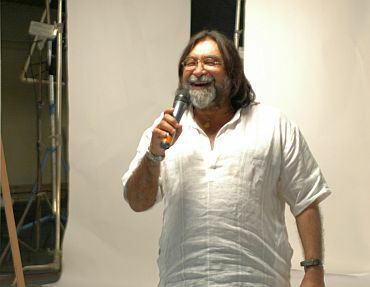 Ad guru Prahlad Kakkar also put in an appearance at the Mumbai leg of the auditions. The contestants charmed the cameras with solo shots, each secretly hoping that the banner in the background was referring to her! And here, we see Kasbekar and Gujral with the final line-up from Delhi -- they will soon face competition from the Mumbai and Bangalore babes in Goa. Check back soon, because we'll be bringing you all the finalists' profiles shortly! PIX: Celeb-spotting with Shilpa, Gul and more!